"Until there's a baseball stadium built on the moon, we have Colorado Springs." That line, courtesy of veteran Colorado Springs Sky Sox reliever Tim Dillard, was delivered at least partly in jest. It does, however, speak to why the Triple-A Pacific Coast League Sky Sox are moving to San Antonio in advance of the 2019 season. The team's home of Security Service Field -- elevation 6,531 feet -- was a particularly challenging place to play the game of baseball, especially in the frigid months of April and May. The departure of the Sky Sox doesn't put an end to Colorado Springs' Minor League Baseball history, however. It simply ushers in a new era, as the franchise that previously existed as the Helena Brewers will call Security Service Field home in 2019. Pending the results of a "Name the Team" contest, this Pioneer League club will be known as either the Happy Campers, Lamb Chops, Punchy Pikas, Throttle Jockeys or Rocky Mountain Oysters. In both style and substance, next season will be a totally different ballgame in Colorado Springs. The Sky Sox played their first season in 1988, and from 1993 through 2014 were affiliated with the Colorado Rockies. When the Rockies opted not to renew their affiliation following the 2014 season (choosing Albuquerque instead), the Milwaukee Brewers signed on. The Brewers' partnership with Colorado Springs was a case of necessity rather than desire, a result of the Brewers simply having no where else to go as that offseason's affiliation shuffle concluded. The departure of the Rockies organization, a seemingly natural parent club, made it plain that Colorado Springs' tenure as a Pacific Coast League franchise was in jeopardy. Branch Rickey III, president of the Pacific Coast League since 1997, was at Security Service Field for the Sky Sox's Labor Day finale. "I lived here for 13 years. I loved Colorado, I loved Colorado Springs," said Rickey. "So for me there's a bittersweet sorrow here.... The number one impediment that you have here is there's only one high-altitude Major League franchise [the Colorado Rockies].... So any other team that comes to Colorado Springs is immediately skeptical about the disadvantage of the player development for their system. Consequently, you'll have a very practical consequence that they'll work around Colorado Springs and use Double-A to launch some of their players, or hold back some of their pitchers from playing in Colorado Springs. And that's not a good impact on the system. Second is that there's no franchise geographically proximate to Colorado Springs the way it was for the Colorado Rockies. "There's a bittersweet sorrow here," said PCL president Branch Rickey. "The other element that becomes a factor, as we evaluated a relocation to San Antonio, is we've got a major aiport right there in the city. Whereas [in Colorado Springs] we were finding ourselves in [Denver International Airport], having to drive two hours to make our connections. Well, that's just another strain on the players, on the team travel personnel. So this is not a reflection on the community and the way this team has been treated as it is on very practical geographical factors and transportation issues." No matter how sensible the reason, Monday's franchise finale -- a pair of seven-inning doubleheaders, as it turned out -- was a bittersweet occasion for many. Dan Karcher, the voice of the Sky Sox, shared his thoughts in the press box prior to the start of the nightcap. "It's definitely emotional," said Karcher, who at 29 seasons was the longest-tenured voice in the PCL. "It was strange when the Rockies left four years ago and we got the Brewers in here, but it's going to be even stranger not having Triple-A baseball.... It's been a great run and Colorado Springs is home. I never thought I'd be here this long. I thought it would be just a step along the way to the Major Leagues and that didn't work out. But Colorado, there's no other place I'd rather live so that's been a great benefit of getting this job when I first started back in 1990. I found a great place to raise a family and I wouldn't want to be in any other state.... That's something that will take a little bit of the sting away from not doing Triple-A baseball anymore." Sky Sox broadcaster Dan Karcher was the longest-tenured voice in the PCL. The Sky Sox won two PCL championships during their 31 years in the PCL, first in 1992 (as a Cleveland affiliate) and again in 1995. Karcher mentioned these postseason triumphs as among the highlights of his tenure. Sky Sox historian Chris Moyer, sitting down the hall from Karcher in the Security Service Field press box, said the team's 1995 triumph was particularly memorable. "Jim Tatum hit a walk-off RBI single in the bottom of the ninth to beat Salt Lake," he recalled. "It was the perfect scenario. Series tied 2-2, winning run at the plate and Jim Tatum hits a little bloop single to left center [to win the game, 8-7].... It was sort of like [Luis] Gonzalez did for Arizona in the 2001 World Series against the Yankees." Moyer is, of course, well-versed in team history. He pointed out that the roots of the Sky Sox franchise date back to the 1918 Sacramento Solons, who relocated to Honolulu in 1961 and became the Hawaii Islanders. The Islanders moved to Colorado Springs following the 1987 season and adopted the Sky Sox name, which had first been utilized by a Class A Western League team that played in Colorado Springs from 1950 to 1958. Among those in attendance on Monday was Rai Henniger, who got his start in baseball working for the Hawaii Islanders and later spent 17 seasons as the Sky Sox's senior vice president of marketing and promotions. "A lot of these people I've known since I got here in 1990. And they're just wonderful people," said Henniger, whose front office career came to an abrupt halt due to a 2007 fireworks accident. "There's something special about baseball fans, they're not the kind of people who paint their face and swear and go nuts like you see in other major sports -- they're really just special sweet people. And they stick it out." Rai Henniger spent 17 seasons as a Sky Sox senior vice president. Such fans were plentiful during the Sky Sox's closing slate of games on Sunday and Monday. Among them was Jessica Ledbetter, a season-ticket holder who has been attending Sky Sox games since the team moved to Colorado Springs when she was three. "My dad always brought me to the games back when it was just a two-lane road to get here and there was nothing around the stadium," said Ledbetter, seated in the first row down the first base line. "I've gotten to know a lot of people who worked here, a lot of season ticket holders, and so it's just kind of my place to go and relax and watch some baseball and hang out.... It's disappointing [that the Sky Sox are leaving]. I understand to a certain extent why they're doing it, but at the same time it's hard, to feel like we're losing our team." Further down the first base line sat Hubert Jones, alongside his wife, Caren, and sons David and Michael. Fans Jessica Ledbetter and Hubert Jones and his son Michael reflected on the Sox era. "It's all for my boys, the players are so great with my boys. Lots of times, they'll come by, give my boys fist bumps," said Jones, whose family has attended over 110 games the past two seasons. "My boys give 'em candy before every game. Some guys take it and some guys don't. Werther's Original, and then coach Sweet gets his jelly beans." As if on cue, Sky Sox manager Rick Sweet sauntered by and grabbed a bag of Jelly Bellies that Jones had placed on the railing. "See, it's a family atmosphere and that's what we're gonna miss next year, really," said Jones. The Sky Sox era couldn't have ended in a more agonizing fashion. The team entered Sunday needing one win to clinch the PCL's American Northern Division over the Oklahoma City Dodgers, their opponent for the season's final series. They couldn't get it done despite having four opportunities to do so, losing the completion of a suspended game Sunday, Sunday's regularly scheduled game and then getting swept in a doubleheader Monday. Despite this dispiriting conclusion, a party atmosphere prevailed postgame Monday. Fans were given free reign of the ballpark, with entertainment options referencing the finalists in the "Name the Team" contest for the incoming Pioneer League franchise. This included free deep-fired cattle testicles (Rocky Mountain Oysters), a basepath fire pit (Happy Campers) and a videboard showing of Top Gun (Throttle Jockeys). Clearly, it was already time to start thinking about the future. 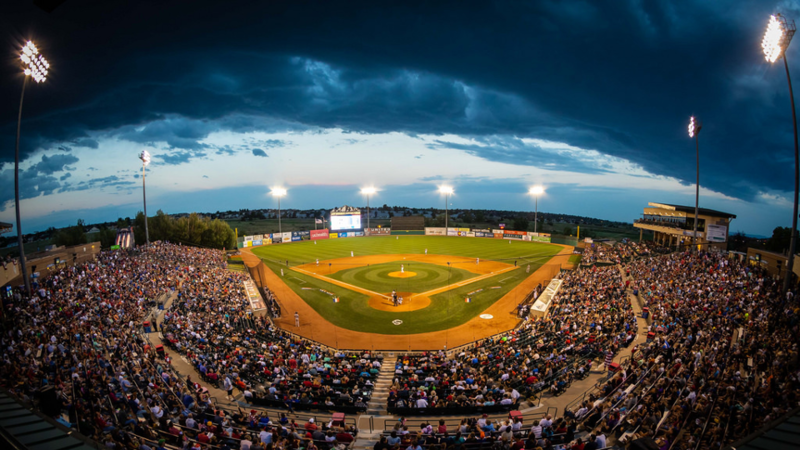 The team's front office believes that Colorado Springs can join the likes of Vancouver and Spokane in terms of transitioning from a subpar Triple-A market to a thriving short-season locale. "It's gonna be a challenge, undoubtedly," said assistant general manager Keith Hodges. "It's going to be more important than ever to engage with the fans.... They want to see good baseball but 50-cent hot dog promotions, doing some fun things with our interns, being silly. Not taking ourselves too seriously is going to be important too." "It's a new era, man, and we're super-excited," added general manager Chris Phillips. "[Short-season] is a better model for this city and this community. It's a lot more fun, it's raw, the staff is re-energized. We're super-pumped about it and ready for a new era of professional baseball in the Springs."